Swiping to manage messages is iMazing! While my house also includes Apple products, I don’t like to relate a name of a product that begins with an “i” with anything from RIM, but there are a few exceptions to that personal rule. One of which is a new app from emacberry called iMazing. 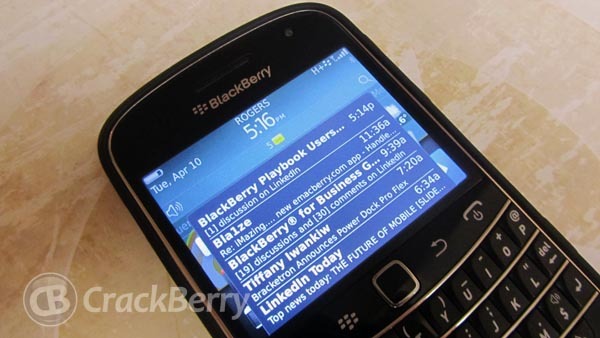 If you have a BlackBerry smartphone with a touchscreen, you can use iMazing to view and manage your incoming messages simply by using gestures. When new email (or emails) arrives, iMazing will pop up a list of all unopened messages that show the sender and subject for each one. Tap on the message once to view a preview of a particular message, including; the body and the options to reply, reply all or forward. At this point, it may seem like your standard message pop up application, but iMazing is just getting started. You can also swipe to the left or right to mark the messages as read and delete them - respectively. For anyone who wants to be able to manage incoming email quickly, iMazing is loaded with just the right moves (literally). That being said, it should be noted that iMazing can only display new and/or unread messages; read messages have to be accessed through the native message app. You also cannot make use of the Flag for Follow-up option, which some are keen on using. Non-native apps appear to lack the ability to use this feature. iMazing is available for free, but in order to get full use of the app, you need to make an in-app licence purchase of $1.99; this includes the ability to view an unlimited number of new messages. The free version will only display the most recent unread message. Through the options menu, you can choose what the gestures can do, when to mark email as read, or even decide where on the screen you want to see the popup. Again, the app is only available for touch screen BlackBerry smartphones. iMazing is available from BlackBerry App World.